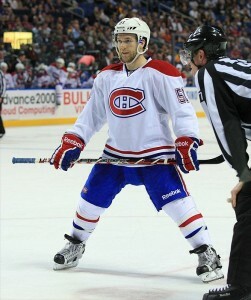 For all of his drawbacks, maybe Montreal Canadiens forward David Desharnais isn’t the root of the problem. Granted, he may not be part of the long-term solution, with only one power-play point since late November despite seemingly preferential deployment on the man advantage, but Desharnais takes a lot of abuse—a lot of it unjustified. Consider how it’s been two games now that Desharnais has been out of the lineup, with the Habs announcing on Friday that he will stay that way for three weeks with a broken foot (no lower-body specification needed, apparently). Needless to say, Desharnais is no Carey Price. Proof to that effect can be found in the fact that the Habs are a modest 1-1 in his absence, with that one victory coming in a shootout against the non-playoff-bound, albeit somewhat-surging Philadelphia Flyers. Admittedly, the Habs wasted a decent showing without him against the Colorado Avalanche, giving up the game-winning goal late in that one (kind of) off a P.K. Subban turnover. However, if Desharnais was even close to the weight dragging this team down some people believe him to be, this would be the point at which the Habs would make a playoff run. And, yet, unsurprisingly without Price, not only are the Habs still failing to gain any kind of ground in the Eastern Conference, but Alex Galchenyuk is still being started on the wing. So, rightly or wrongly, it’s readily apparent that in the eyes of the team’s coaches, Galchenyuk is simply not ready, from a defensive standpoint most likely, to play center. Desharnais has little to do with it, other than playing the right position at the wrong place and time, in Montreal, coinciding with Galchenyuk’s formative years as an NHL player. There’s little denying that Desharnais is still weaker defensively than Galchenyuk. However, considering the team’s current situation, should it really matter if the team deems it better for Galchneyuk’s long-term development to play him on the wing at the expense of any success that would come with him at center during this current season? At this point, that would be counter-productive. So, ultimately, Galchenyuk is being brought along slower than a tortoise in a road race at a red light. However, P.K. Subban was also a supposed victim of a similar “tough love” approach by head coach Michel Therrien, and he turned out all right. And Subban did, following up the Colorado game with a dominant performance against the Flyers. So, maybe, just maybe, Therrien knows what he’s doing in regard to Galchenyuk. And maybe Desharnais, with a contract expiring next season, is just his placeholder down the middle until then, with it having been proven this year that Lars Eller is at his best playing the third-line shutdown-center role. Desharnais is perhaps not a top-six forward, but the success he had earlier this season, playing with Dale Weise and Tomas Fleischmann, indicates that, in the right role, he is a legitimate NHL one. While the well dried up for that line long ago, it did for the rest of the team as well. That doesn’t mean the likes of Subban and Pacioretty don’t belong either. And, if you look at Desharnais’ career numbers, he can be expected to produce upwards of 50 points annually. He might not produce as much as a prototypical center in the same role, but all he can do is play in the role he’s given. That’s not up to him. Desharnais might not be the offensive sparkplug many thought he might be following a 60-point season earlier in his career. However, he shouldn’t be a lightning rod for criticism either. All signs point to him giving it his all whenever he’s out on the ice. That’s all anyone should be asking of him.